Oregon State University’s International Living-Learning Center (ILLC) is symbolic of many things: a shift in the approach to serving international students; the power of collaboration; and the globalization of higher education. The modern, elegant aesthetic reflects the building’s purpose – to represent the institution’s vision of a 21st century education. In 2008, Oregon State University (OSU) undertook a comprehensive internationalization agenda to create an increasingly globally diverse and integrated campus, improve the overall student experience, and enhance international students’ access to higher education. To help usher in this transformation OSU enlisted the help of INTO University Partnerships (INTO). The partners formed a joint venture and created an entity under the name INTO OSU. This partnership was a key element of Oregon State’s long-term commitment to transform the OSU student body and campus community through internationalization. By leveraging its expertise and resources, INTO helped increase the university’s capabilities to attract international students in greater numbers and developed academic programs and support services to meet the students unique needs and ensure their success. The university-led effort to construct the new ILLC became a physical representation of these institutional changes. Construction of the ILLC began in 2010. The vision for the building was to create a physical space to celebrate and facilitate the international experience of all OSU students. By centralizing and increasing the accessibility of resources for international students, the ILLC also seamlessly weaves these students into the fabric of campus life, avoiding the physical isolation that often befalls international students on other campuses. The center was designed to include classrooms, student residences and office/administrative spaces; a unique approach in higher education as only a small handful of other institutions combine these campus functions under one roof. The facility planning was managed by a team of internal and external stakeholders – including representatives from INTO – deviating from the traditional approach seen at some US institutions. The planning started with campus focus groups to determine the need, location and specifics for the building. Departments including university housing, dining and facilities were then brought in for additional insights. Together the team planned a building that would enrich the experience of international and domestic students alike. The $52 million, 148,000-square-foot ILLC includes living and learning spaces uniquely designed with the needs of international and domestic students in mind. It features 25 classrooms, 350 bedrooms for international and domestic students, a 100-person auditorium, a Learning Center, multi-faith room, communal kitchens that facilitate the sharing of foods and cultures between students, a coffee shop, food market and office space for INTO OSU programs and other international student services. The building also features many green elements. Floor-to-ceiling windows provide ample natural light but also reduce energy costs. Solar thermal panels are able to provide 100 percent of the building’s hot water in the summer and around 20 percent in the winter months. The building also features increased insulation, dual-flush toilets and occupancy sensory-lights to make the most efficient use of resources and university funds. Each day, the ILLC is alive with intercultural activity and serves as the hub for more than 1,300 INTO OSU students. The building offers students a central place to study, develop friendships and access academic, social, and cultural resources and activities offered by the university. 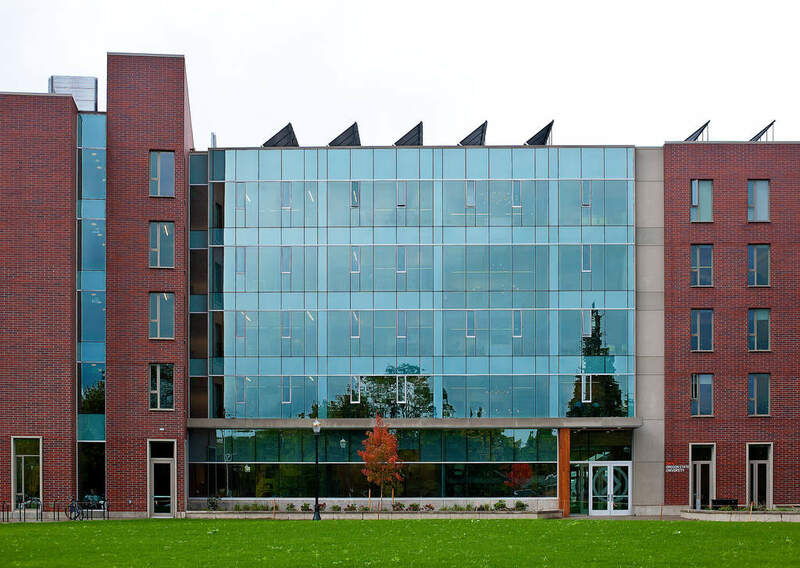 This purpose-built facility has, in part, led to rapid growth of Oregon State’s international student population. International student enrollment at OSU continued its resurgent growth after a decline in the early part of the decade. In fall 2012, OSU enrolled 2,859 international students, a 21 percent increase over the previous fall’s enrollment. INTO OSU was instrumental in this increase. Since the initial partnership with INTO, the university has increased its international student population by 78 percent, and expects increased interest from international students to continue. In order to continue to cultivate a global culture and provide additional opportunities for international and domestic students, Oregon State University is expanding its facilities further. The university’s branch campus in Bend, Oregon plans to increase its enrollment capacity beginning in 2015 by offering four-year degree programs, as well as INTO OSU Pathway programs designed specifically for international students. The planned growth will transform a small satellite location comprised of about 1,000 students into a robust campus that will serve 3,000 to 5,000 students by 2025 and the diverse needs of the central Oregon community and beyond. As Oregon State University looks to the future, OSU remains committed to its mission of serving as a land grant university for the 21st century by providing a rich, diverse experience for all students and supporting their academic and personal success. For more pictures and information about more about the facilities and programs at INTO OSU, click here.